Pearlin started writing business motivational books about 11 years ago in 2008. Driven by her thirst for entrepreneurship, she Googled and found 20 inspiring "bosses" and interviewed them for her first book, Boss Of Me which became a bestseller - and three other books followed, Sleep & Get Rich, Secrets Of Asia's Most Successful Internet Gurus and Do You Have What It Takes To Be Boss. She scored another national bestseller with her biography of Boyd Au, titled I Don't Want To Be Poor, The Boyd Au Success Story. At the same time, she was contacted by Stamford Tyres to write a book for their chairman, Mr Chua Kim Yeow, Singapore's first Accountant General ... and the rest as they say, is (book) history! Featured top 20 entrepreneurs in Singapore, including Dr Georgia Lee, Mr Wee Kok Wah of Stamford Tyres, director Royston Tan, and many more. 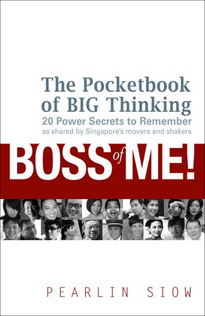 Boss of Me became a bestseller at Popular Bookstore when it was launched. It is available in all local bookstores, on Amazon as well as regionally in Hong Kong, Malaysia, India, Thailand and Australia. Profiled top 10 passive income earners in Singapore and they include Dr Dora Hoan of Best World, youngest insurance agent millionaire Merry Riana as well as property guru Mohamed Ismail of PropNex. Sleep & Get Rich is available in all local bookstores as well as on Amazon. Started out as an e-book where she interviewed eight Internet entrepreneurs who are quietly making millions online. This was later made into a print book called Secrets of Asia’s Most Successful Internet Gurus, and launched on July 2009. Do You Have What It Takes To Be Boss? Featured interviews with entrepreneur Kenny Yap of Qian Hu, hotelier Loh Lik Peng of New Majestic Hotel, Theresa Chew of Expressions, Ryan Lee of X-Mini and Lim Choon Hong of XTRA Design. All proceeds from this book were donated to The Straits Times School Pocket Money Fund. The Boyd Au Success Story. A biography of one of Singapore’s top entrepreneurs, Boyd Au, who rose from a Salvation Army waif to the chairman of a listed company. This book became number one on The Straits Times Bestsellers’ List one week after it was launched! An Illustrious Career Remembered. A biography of Stamford Tyres’ retired Chairman who was Singapore’s first Accountant-General and a highly prolific civil servant. This was a privately commissioned book and not for sale. Currently, Pearlin runs Boss Of Me – a boutique book-publishing agency based in Singapore that helps people write as well as publish books. Together with her team of content specialists, she has written several bestselling biographies for top entrepreneurs and companies in Asia. Her clients range from billionaires to stay-at-home mothers. When not hanging around inspiring people or travelling, Pearlin can be found in the yoga studio perfecting her asanas.